Whoo Whee! 6 foot 3! Well-- I have been working on my socks! The Hat Project—105 hat later. I am asking myself that question! Some are easy—I just need to make some PDF’s of existing files, and upload those to my Ravelry collection. Some are harder—since I actually need to write the patterns up! Some are harder still (I need to transfer a hard drive—which means so much more that just doing that) to get to the file. I need to start some gifts, and some projects for my DD—she will be doing the Avon run walk again this year, and I want to do some more stuff for her fund raising efforts. And then there are the non-knitting things I have in my mental queue—a skirt or two to sew up, and some knitting bags (as gifts) and other sewing projects. And some earings I want to make—for me and for the above mentioned fund raisers to come. 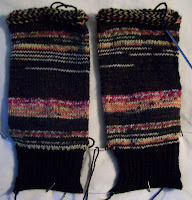 Well I have done some knitting—here are the black jack socks—with a heel flap, if not a turned heel! So what next? I dunno! Ah, I recognize that kind of paralysis! I've been in the same kind of quandary myself recently. Such a long list! But filled with good ideas. I hope you accomplish everything you want!